That's right, we have a, one, single, solo heartbeat with baby measuring 6w5d (I'm 7w0d today). We were able to get some images and video (without sound) directly from the u/s machine, and Jon was able to record the u/s screen on his phone so that we can listen to the heartbeat on that video. Of course I cried. Who wouldn't in my shoes? 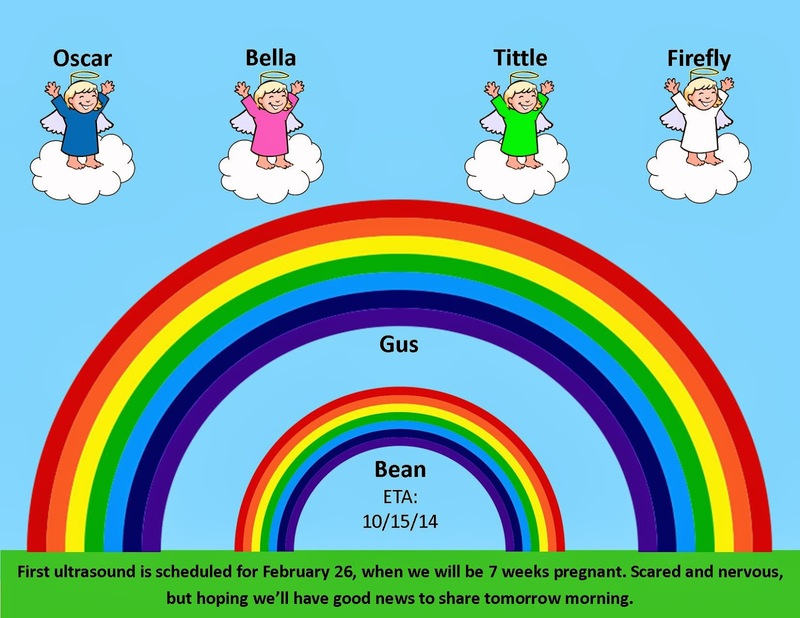 I'm just so relieved that there's only one baby and that Bean is measuring well. And the support from those around us is great. We posted this pic to FB last night, as Jon needed some support leading up to the appointment. The comments from people have been amazing. We had so many people sending us positive thoughts that it really did help give me some confidence that we were going to get good news this morning. That doesn't mean I was not, and don't continue to be, terrified that something will happen to Bean, but to see that everything looks good was a momentarily relief. Congratulations! I know the relief of hearing just one heartbeat. I will be thinking of you and your family! Thank you. This is the first time we're starting with one (other than Firefly), so I'm hoping that's a good sign. Congratulations! I'm so sorry to just be commenting now, but I've been holding your good news in my heart all weekend. I'm keeping all appendages crossed that the news continues to be good. Abiding with you. Thank you so much, Esperanza. We'll definitely need good thoughts coming our way as we approach a loss milestone--9w on 3/12. Congratulations my friend! I am so happy to return to the world of blogging to read this news :) I hope you cruise from one good appointment to the next. And I love that image of all your babies.Sending hugs. Thanks, Sadie. I'm glad (on more than one level) that I could give you a good return to blogging. I'm thinking of you, H, S and Seedling often.